Markets went up, they went down, but mostly there was little change. 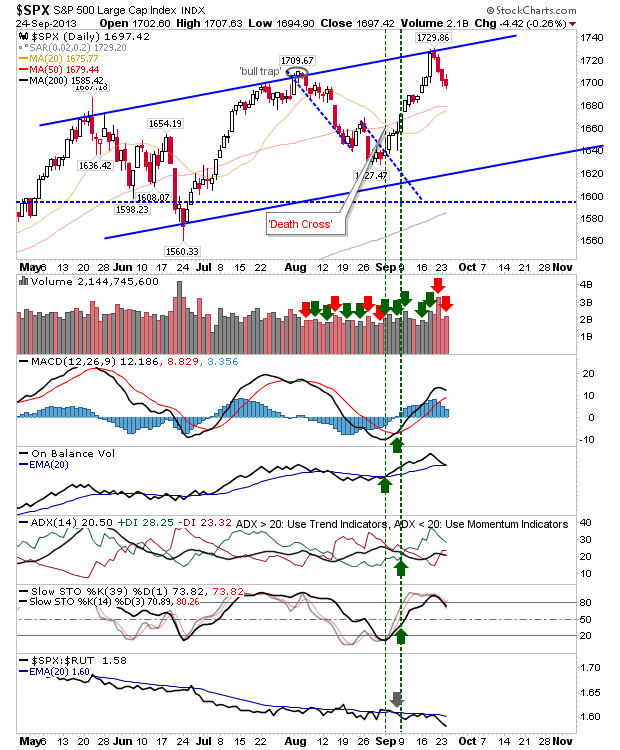 Only Large Caps came out with a downside edge: the Dow will probably see a test of the 50-day MA today, while the S&P works towards a new 'Golden Cross' between 20-day and 50-day MAs, which should offer support if the selling continues. The S&P did register another distribution day, although this hasn't yet led to a 'sell' trigger for On-Balance-Volume. 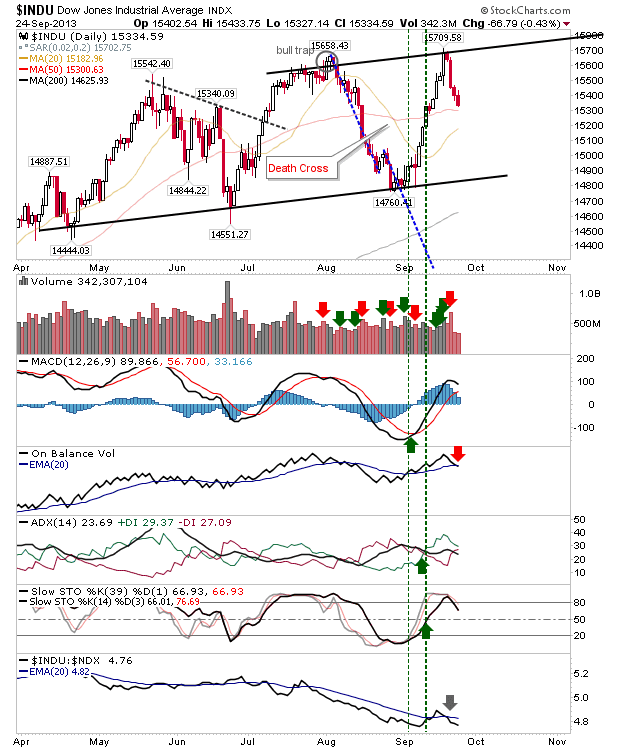 The Dow did see an On-Balance-Volume 'sell' trigger, but didn't register a distribution day. Of all the indices, this looks the most likely to fall further. However, it would be a tough short as it's more range bound than anything, and in this environment, things can get scrappy. In contrast, the Russell 2000 still looks well placed for long side trades. Stops can go on a loss of 1,059. 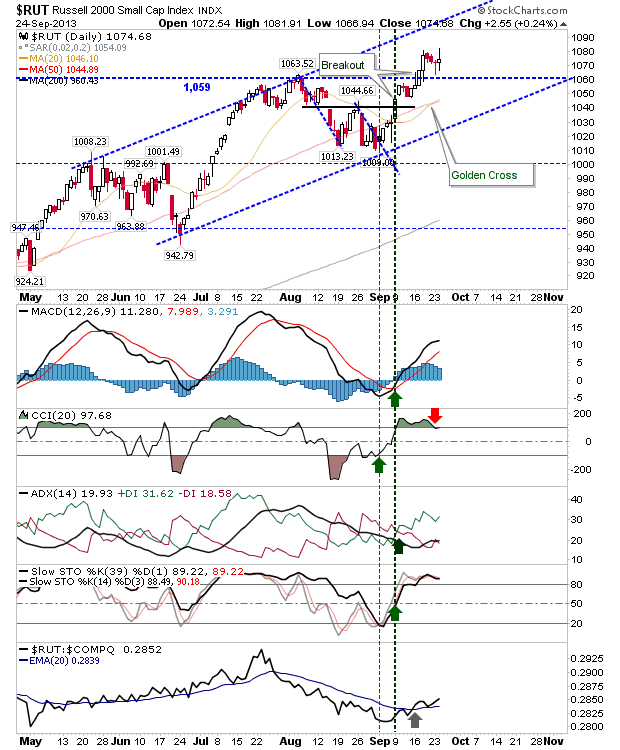 The Nasdaq 100 is also performing well for bulls. 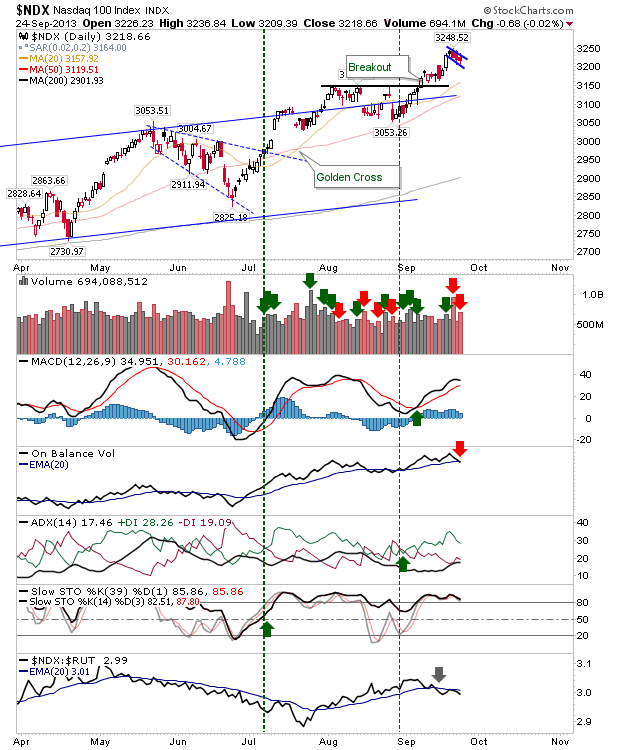 The two distribution days in three is a concern, but the action has been tight, and looks more like a bullish flag than anything else. Buy upside break of flag, stop on loss of 3,200. At least on Tuesday's close, the market still favors bulls. The S&P hasn't hit the '10% sell threshold' relative to its 200-day MA, which is bearish divergence, as it hit this mark in July and August. Therefore, this isn't a time to be building long term positions, but short term trades could prove profitable.